Laminate countertops are an old-school staple that is once again growing in popularity courtesy of realistic patterns that look exactly like marble, soapstone, wood, and more. Fans of retro décor will appreciate that laminate is still available in mid-century inspired motifs and eye-popping colors. Even better, new laminates are more wear resistant than ever before — when shopping around look for options that stand up to scratches and stains. Here are our favorite laminate kitchen countertops for your consideration. Turquoise laminate countertops sprinkle on retro flavoring in this contemporary white kitchen in a mountain retreat by David Benners Architecture out of Dallas, Texas. The herringbone subway tile backsplash adds a pop of subtle pattern. The flat front cabinetry is not only stylish but a snap to wipe clean because the doors are smooth and not recessed. Pink, black, and white are the dominant colors in this cottage kitchen renovated by Chicago based firm, Open Door Architecture. The laminate counters are a matte pattern called Basalt Slate by Formica. We are head over heels with this Mondrian inspired kitchen by Ande Bunbury Architects out of Australia. Every square inch is customized to the client's taste. The colorful cabinet doors were all hand-painted. Against the wall is a two-tone laminate countertop in red and blue. The countertop below the window and around the sink is stainless steel. Wood patterned laminate countertops are the frosting on the cake in this kitchen in a newly built home decorated by Canadian design firm, Flawless Space. Your grandmother's laminate countertop had a stylized design (think field daisy or cracked ice) with a dull, matte finish. But these days the material is available in glossy patterns that mimic the look of authentic stone. Case in point, the example shown here called Strata Olympico by Formica. The laminate uses a proprietary technology called EliteForm that creates a high shine surface that is both stain and scratch resistant. In an L shaped cooking space by Erotas Custom Building out of Excelsior, Minnesota cabinets painted a shade by Benjamin Moore called Ivory White are paired with a gray laminate kitchen countertop. The backsplash is white subway tile. Two schoolhouse pendant lights supplement the recessed lighting. A butcher block kitchen island adds an extra work surface. Yes, laminate countertops can look thoroughly modern as shown in this kitchen in an updated Victorian home by California based, Fougeron Architecture. The steely gray counters match the stainless steel appliances while adding a little contrast against the bright, white cabinetry. This retro kitchen is brimming with vintage charm. The homebuilders at Hammer and Hand based in Seattle, Washington installed an L-shaped red laminate counter on the right. On the left is a slab of maple butcher block. Two-tone laminate countertops with gray tops and wood patterned edges add striking contrast to this contemporary kitchen by the construction firm, The Chuba Company based in Elk River, Minnesota. The glass mosaic backsplash lends color and texture to the cooking space. The blue walls provide a beautiful backdrop for the crisp, white cabinetry. Get the look of granite on the cheap with a laminate countertop. This white kitchen spotted on Wilsonart features a granite pattern called Winter Carnival. Thick orange laminate countertops make a room-brightening statement when paired with wood laminate cabinetry in this contemporary kitchen by the interior design firm, Webber and Studio Oculus out of Austin, Texas. A matte laminate countertop in a pattern called Graphite by Formica is combined with wood base cabinets in this lovely modern kitchen by Todd Davis Architecture situated in San Francisco, California. Here is a bright and colorful cooking space by Space Craft Joinery based in Australia. The countertops are a white laminate with a bull nose edge. The latter is a soft finishing touch that does not have seams like square edge laminate. Makendo, the thrifty DIY'er behind this countertop tutorial, spotted on Instructables says his laminate countertop project cost less than $400. Initially, he was going to install to quartz until he realized it would set him back a whopping $8,000. This builder-grade kitchen by Canadian interior design firm, Flawless Design, is anything but cookie cutter thanks to a laminate countertop by Wilsonart called Graphite Nebula and a luxurious marble subway tile backsplash. Scott and Allie, the two do-it-yourselfers behind the blog Scott and Allie Buy a House spent less than $1,100 to buy and professionally install their new Soapstone Sequoia laminate countertops by Formica. The counters have a chic Ogee style edge. 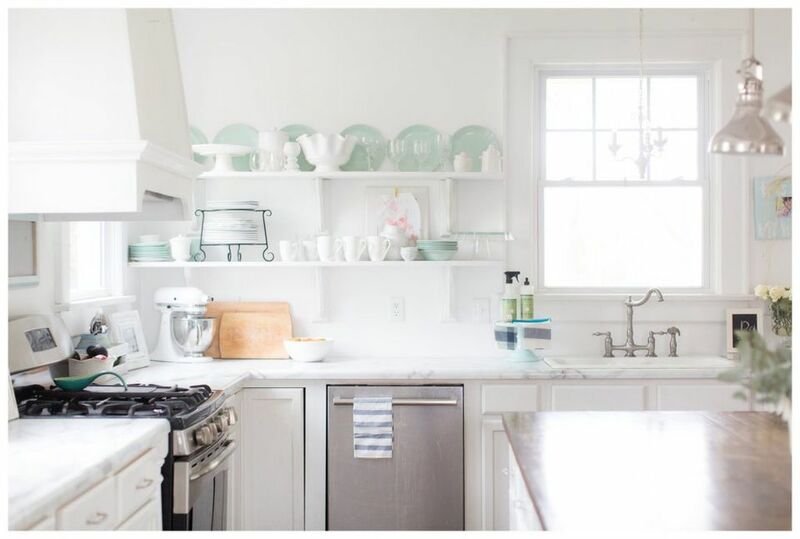 We love a good retro kitchen renovation like this one by Meghan Meyer. She is the Florida blogger behind Metaphors Mixed. Her 1950s stove and midcentury ranch house fueled the decision to go vintage inspired. But the trick was creating a cool cooking space that was not dripping in retro kitsch. Going with a Jetson's inspired laminate countertop by Wilsonart called Glacier Boomerang set the vintage tone. To keep the kitchen from feeling dated Meyer opted for several modern features. First, there is the herringbone subway tile backsplash in cream, gray, and blue. While the cabinets look like old metal ones, they are brand-new wood cabinets with retro-inspired knobs. The spanking fresh ceramic sink works with the cooking space's retro appearance, but because it is an under mount, it adds modern convenience. Amber Tysl, the lifestyle blogger behind The Yellow House, created the kitchen of her dreams for $5,000. Going with Formica Calcutta marble laminate helped her save big. Her countertop cost less than $620 — that's right! Amber could not be happier with her beautiful new surface. She says it is insanely easy to keep clean even when hot glue drips all over the counter. Solid Surface vs. Quartz Countertops: Is One Better? What Countertop Sheen is Best for Hiding Fingerprints? Is White Marble a Viable Option for Today's Kitchen Countertops?